As I sat down to eat breakfast on Friday morning, I opened up my laptop and refreshed my Facebook page. Time to see the latest status updates and pictures from the night before. Just your typical morning run-through before heading out for the day… at least that’s what I originally thought. That’s before I saw someone’s status about a shooting that had occurred earlier that morning. That’s before I heard about Sandy Hook Elementary School. Looking back, I probably shouldn’t have surprised. 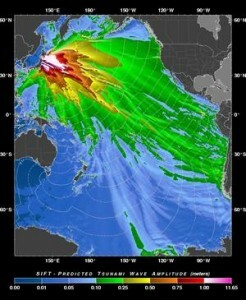 The tsunami that took place in Japan last year? The Aurora movie theatre massacre? Trending topics of Twitter. The Sikh temple shooting? Found out through Facebook. Increasingly, social media networks have become my main source of news. Sites like Twitter and Facebook have become a “front line” of sorts, providing initial news coverage, information, and updates long before traditional news outlets are on the scene. And while nothing could have been done to prevent the Sandy Hook Elementary School tragedy in regards to social media (since it happened in the span of just a couple minutes), there is both a time and a place for social media to take place during most emergency situations. Social media should be utilized more often for its widespread prevention and awareness building capabilities. Time and time again, it has proved to be successful. Emergency warnings and alerts: The administration at Virginia Tech was largely criticized for their delayed response on the morning of April 16, 2007. The two hour lapse between the initial murder and the Norris Hall massacre left many people wondering about “what could have been”. Following the tragedy that morning, many universities chose to revamp their emergency alert systems, including more traditional forms of communication (emails and text messages), along with things like Facebook and Twitter updates in order to better alert their student bodies. For the most part, this has proved to be successful. For example, when news of a shooting was discovered by the University of Texas at Austin’s administration two years ago, the university quickly issued emergency alerts, through text and social media updates on sites like Facebook and Twitter. Such efficient crisis communication allowed the student body to take necessary precautions before it was too late. 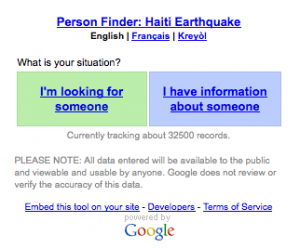 Situational awareness and citizen communications: Shortly following the 2011 tsunami in Japan, Google launched a Person Finder app, in order to act as a central database for finding missing persons during disaster situations. The premise is simple, as there are only two options. 1.) “I’m looking for someone.” 2.) “I have information about someone.” A clear concept, but one with monumental impact. You can’t put a price on a little peace of mind. In the hours following the tornado destruction in Joplin, Missouri last year, a mother-daughter team created a Facebook page, which soon became a clearinghouse for all-things disaster response. It provided media updates, requests for information on loved ones, how to volunteer, and other helpful information aiding emergency response. Administrative rights were extended to over 30 members of the community, ranging from public officials, to employees of gas, electric, and water utility companies in the area. Anyone with a smartphone was provided with a wealth of information to help them through the coming days and weeks. It is important to note that it was the work of a simple mother-daughter duo behind the Joplin Facebook page. Not FEMA or some other government agency (who are still trying to jump on the social media bandwagon). Just some tech-savvy individuals from a little town outside Joplin. Superstorm Sandy was a step in the right direction for many governmental agencies. It is clear that changes are being made. However, more needs to be done in the realm of first-response efforts organized through social media. It is necessary for everyone – from FEMA to The Weather Channel to public officials – to realize the endless potential that social media holds when it comes to emergency management response. To not fully realize the role that technology can play in disaster response, isn’t just a danger. It could mean the difference between life and death.